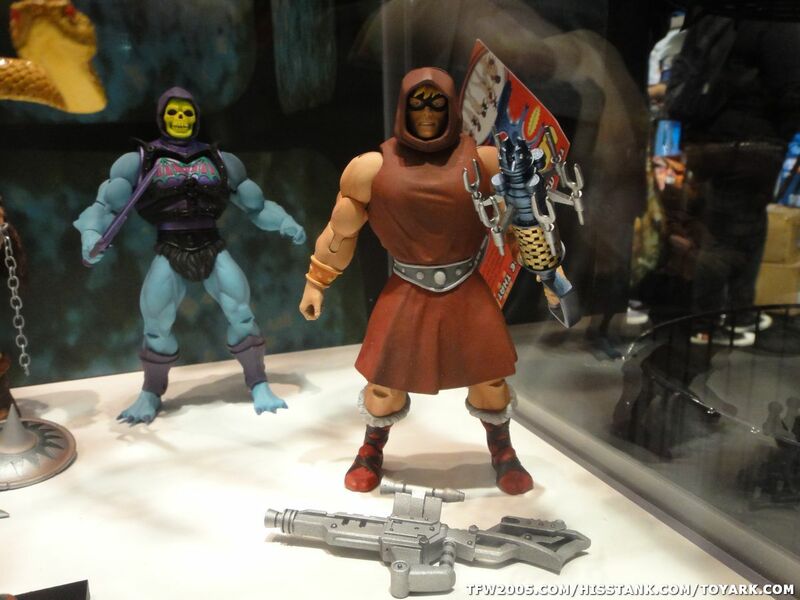 He-Man.org > News > SDCC: The Characters Revealed! Special thanks go to Toyark.com for these cool shots of the figures! 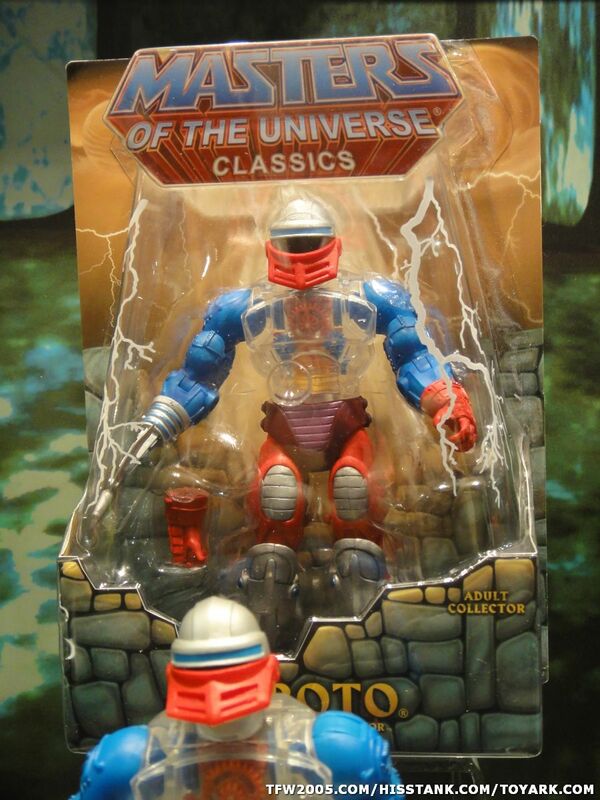 The vintage styled Roboto has multi-colored gears that work when he twists! And the gears are the same exact colors as before! 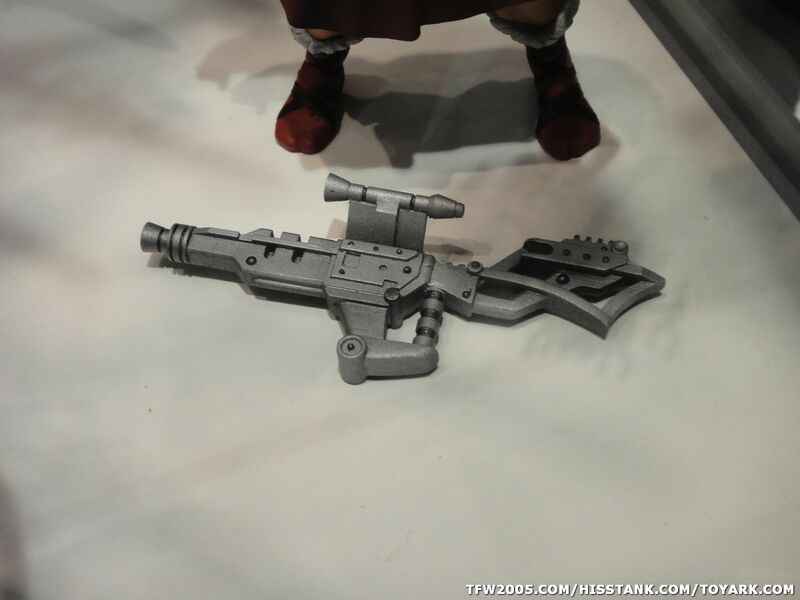 He also comes with a new right hand, which matches his left one and his trademark blaster, claw and axe. 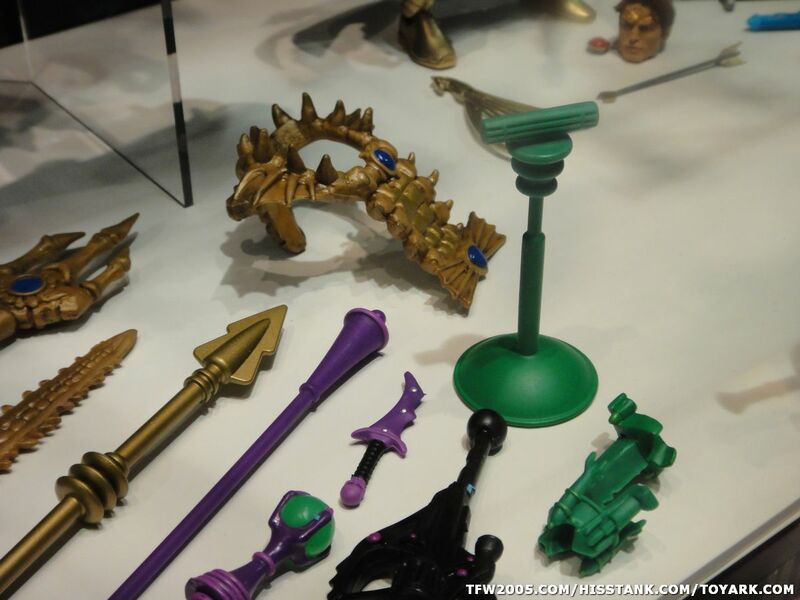 The highlights this time are Mer-Man's sword, armor and trident in their 200X gold colors, Evil-Lyn's weapons in purple with green highlights, King Randor's original spear, Whiplash's "giant can opener" in gold and black, Optikk's rifle and shield in black and purple, Pre-Filmation Zoar's original green perch &armor, a He-Man axe and shield in Faker colors and Roboto's claw, laser gun and axe in Trap Jaw colors! The Evil Warriors have returned to Randor's Royal Junkyard! 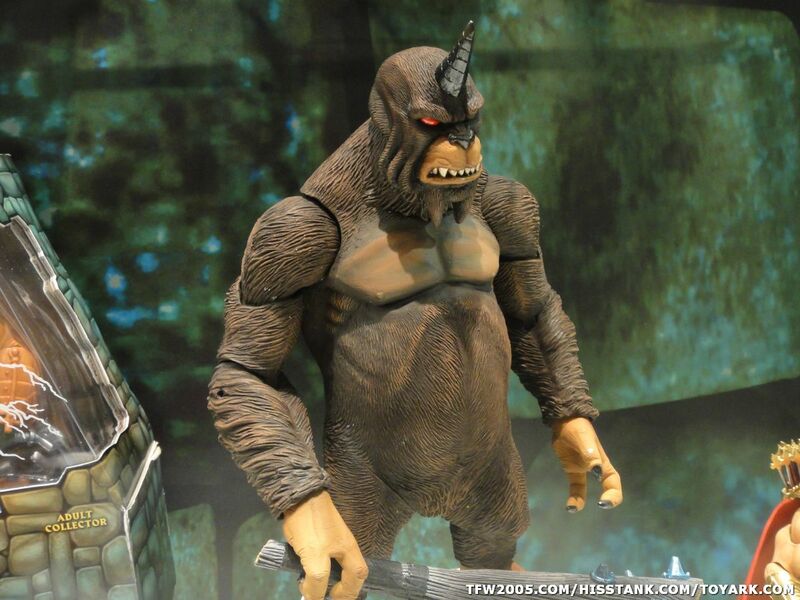 Hordak's furry henchman is the next Hordesman in Classics! 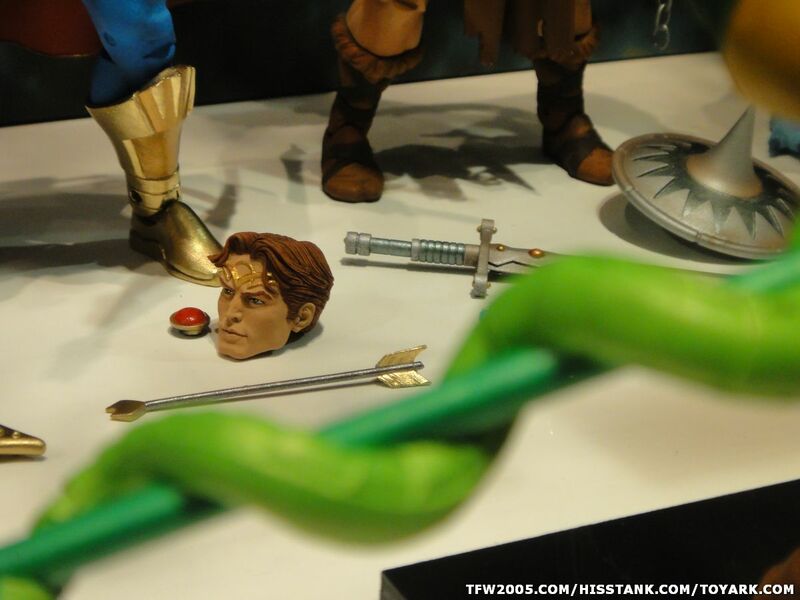 He comes with fur, new yellow bracelets, a green crossbow with a new sculpt (a Cyclops, just like the vintage figure! ), and his 200X staction items: a tribal loincloth, and three weapons--a sword, axe and knife--that can be stored on his backpack! 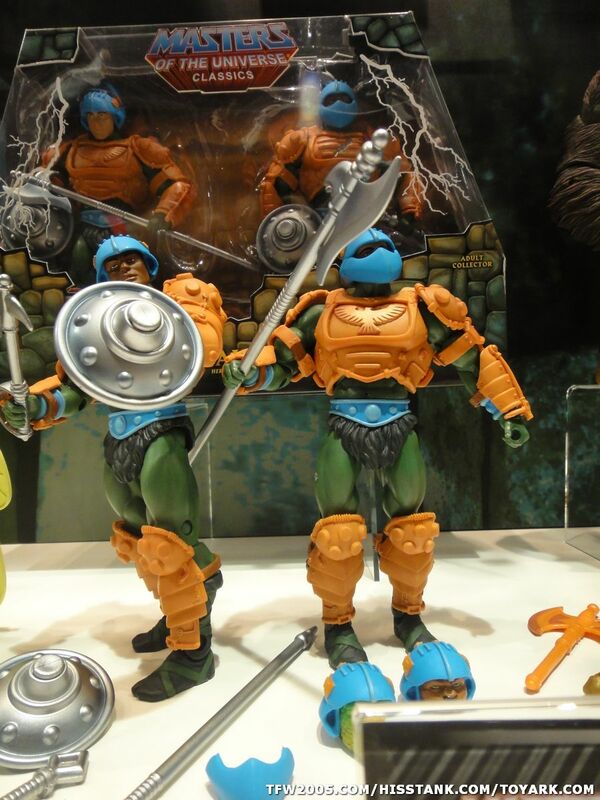 The Royal Guards are the Man-At-Arms inspired guards from Filmation and 200X. They are sporting 4 differernt heads (black guy, white guy, cat guy and lizard guy) with 2 mouth guards, 4 swappable chest plates (including lieutenant rank (the one with the eagle) and battle armor damage), 2 shields, 2 axes and 2 clubs. 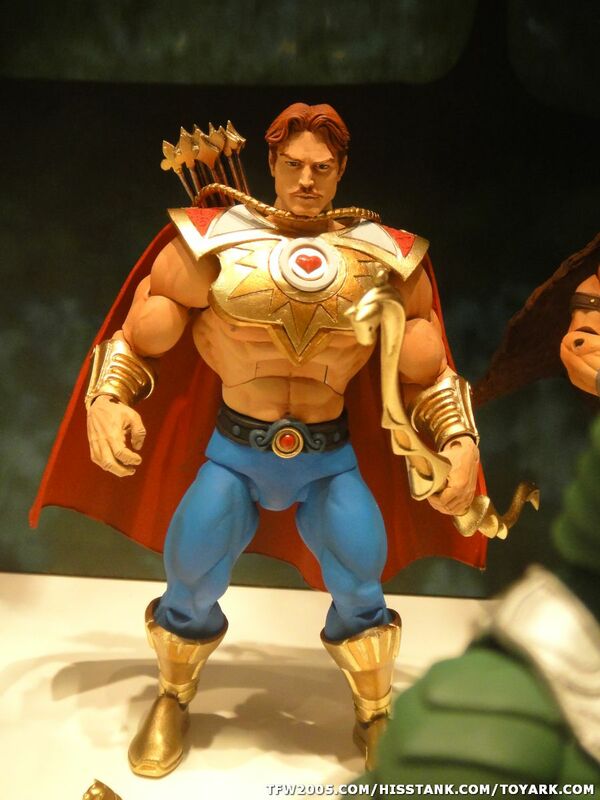 Now sporting the Powers of Grayskull logo on his package, King Grayskull now comes with a red cape, instead of the brown cape and silver on the harness, bracelets and belt instead of gray. 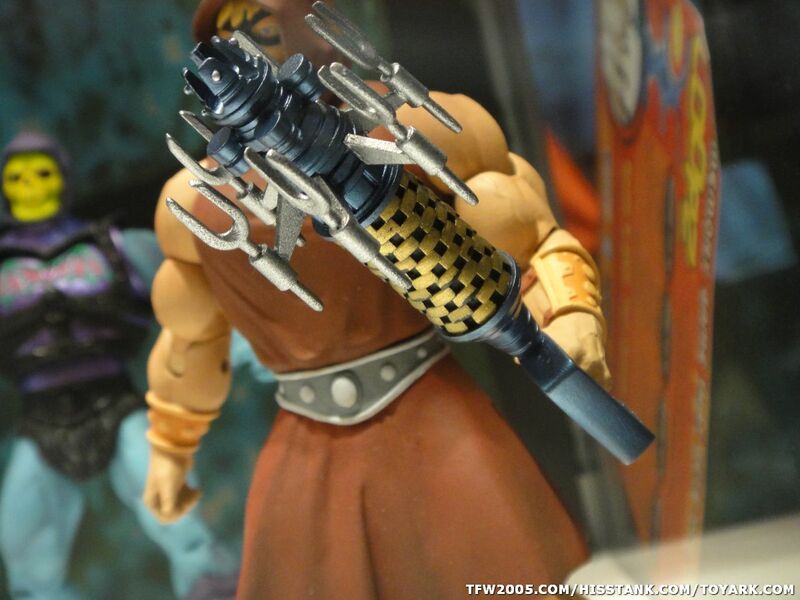 King Grayskull also comes with three power swords, including one that is partly translucent at the top. 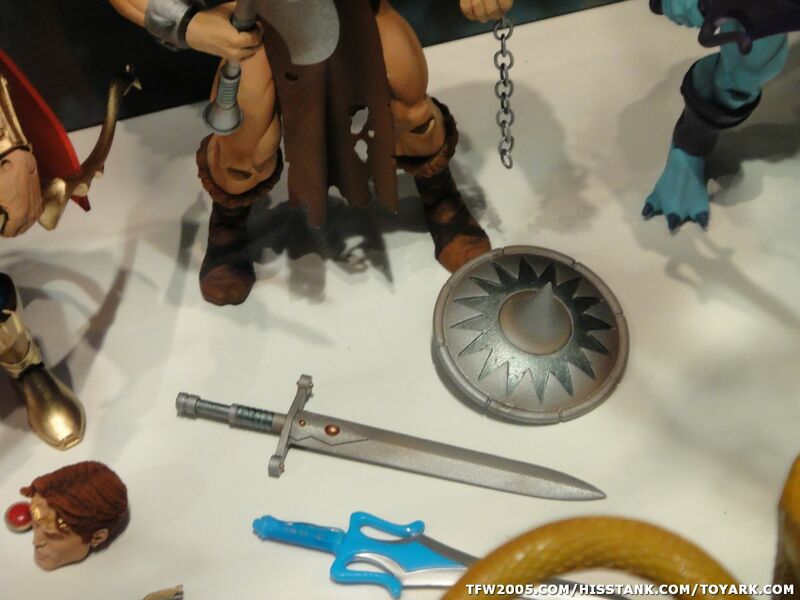 The surprise item is The Orb of Grayskull! 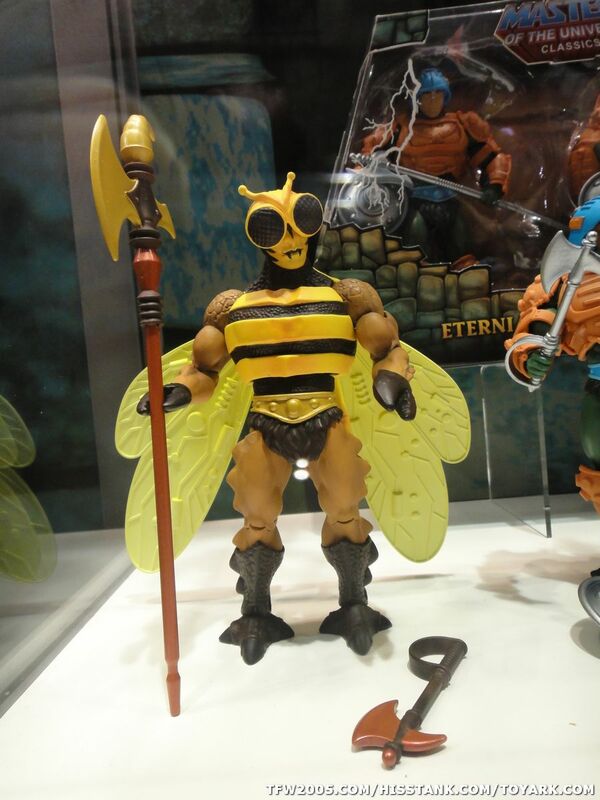 The King of the Andreenids makes his MOTUC debut looking very much like his vintage counterpart, except for the two small insect arms from 200X. 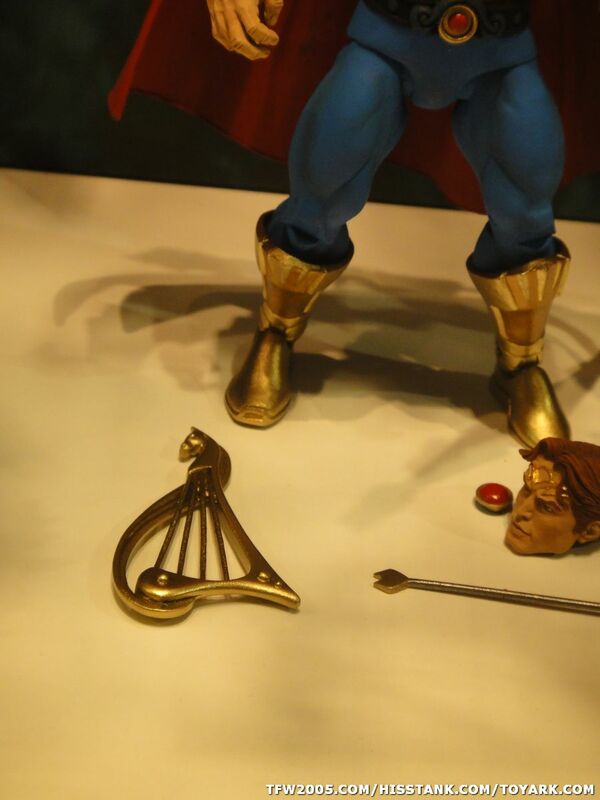 He comes with his 200X Helmet and Halberd, as well as his vintage hand axe. Bow has returned! And he's ripped! The handsome POP swashbuckler and ladies man will come with a mustached and non-mustache head. He also comes with a new articulated hand. He also comes with a harp (Bow is a bard) and an arrow, as well as a quiver. For all of you rugged guys out there, The Four Horsemen made sure that the heart from his armor can be swapped out to a circle. This creature uses the Gygor body. 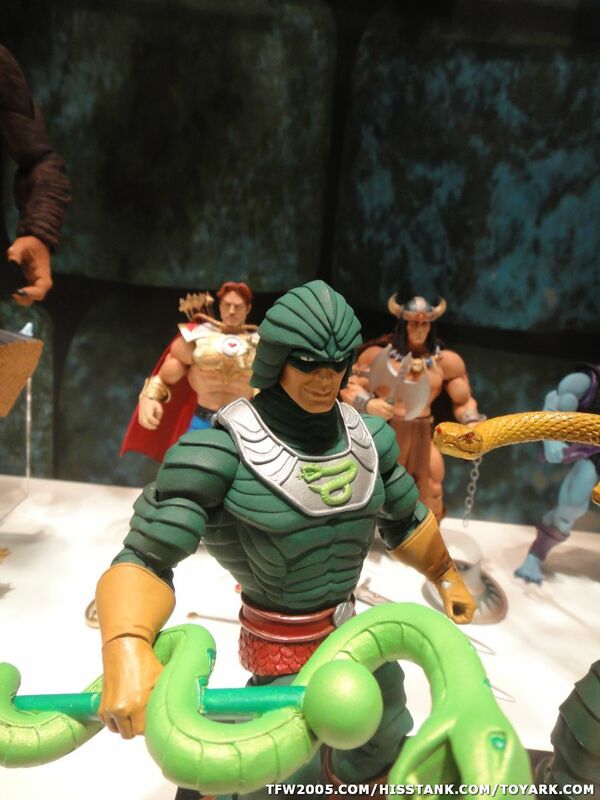 And Mattel doesn't have the Filmation Rights. The Shadow Beasts were featured in the 200X cartoon in the episode "Night of the Shadow Beasts" (the one where Ram Man is afraid of the dark)! He comes with a big club! "What is best in life?" 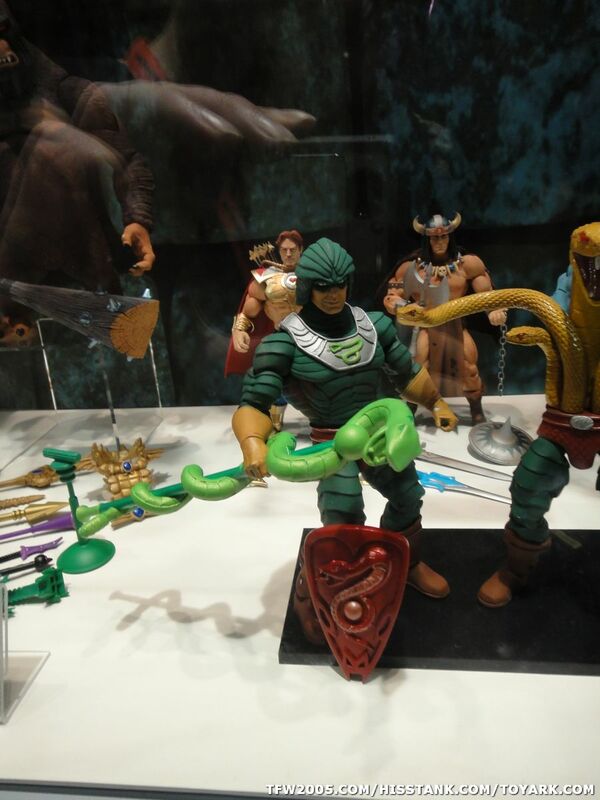 New MOTUC characters! 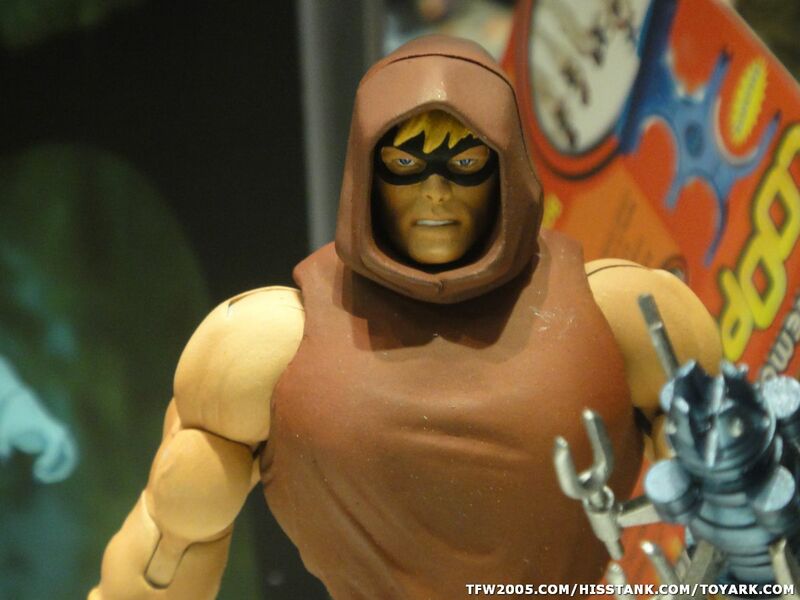 Vikor is based on the original concept art of He-Man! 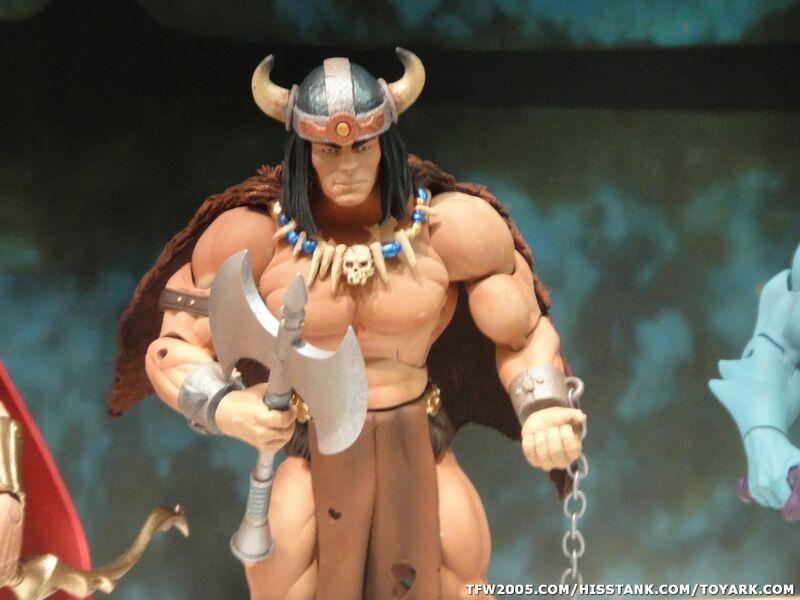 This rugged looking barbarian comes with axe, sword and shield, all new! And he comes with a half of the Sword of He. 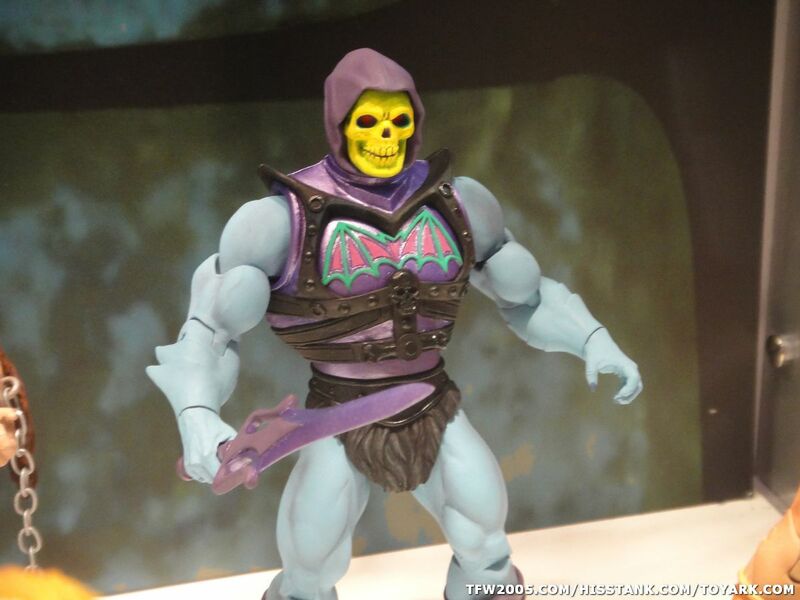 Not wanting to be outdone by He-Man, Skeletor went and got his own Battle Armor! 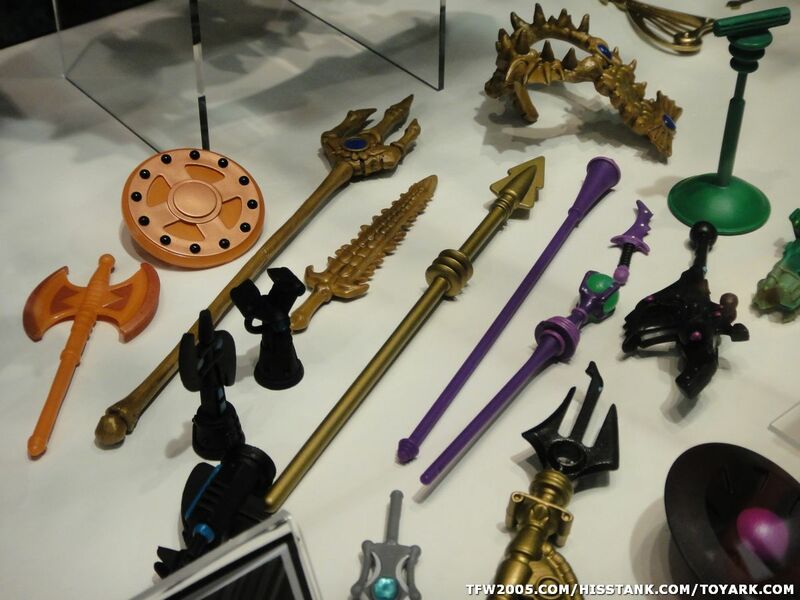 BA Skeletor will come with his own Purple Battle Axe, not the purple Power Sword like pictured. 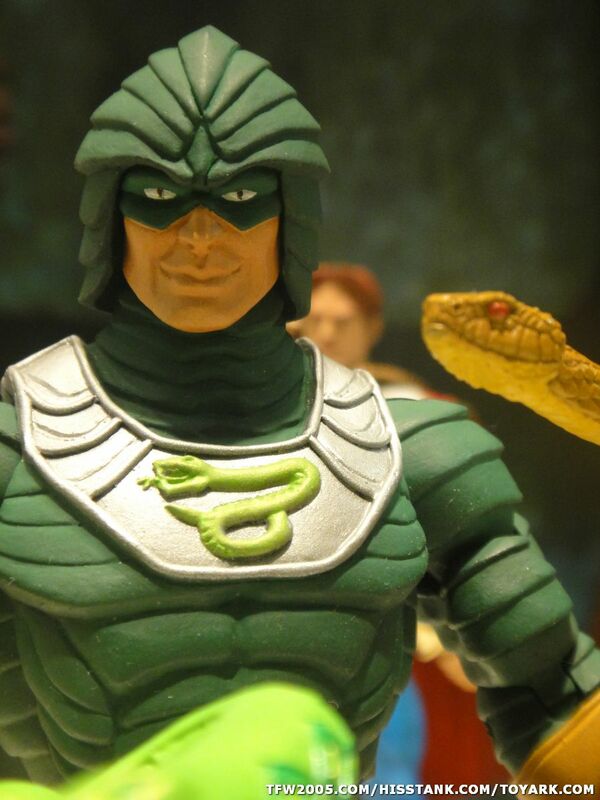 The King of the Snake Men is the original vintage version. 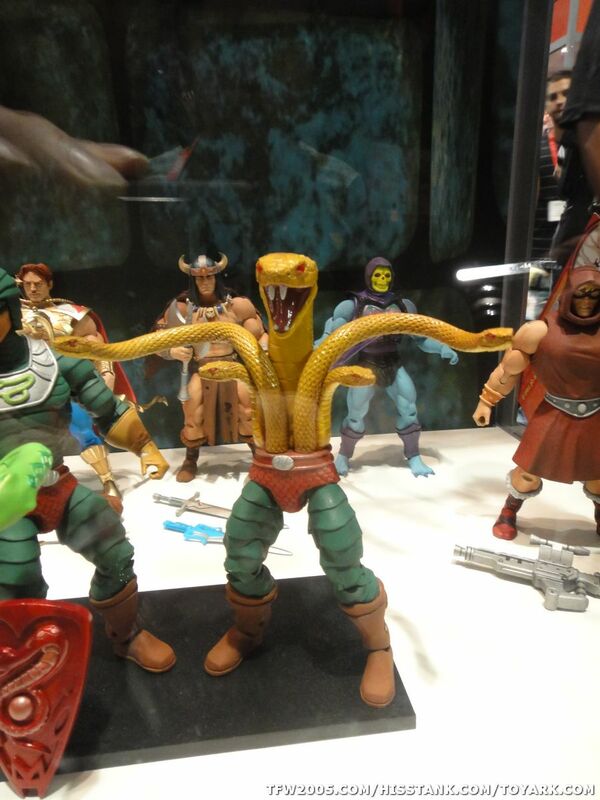 He comes with two swappable torsoes--human form and snake form with bendy arms! He comes with his trusty staff and red shield! This He-Man variant is from the LAST mini-comic, "The Powers of Grayskull" part 1 (parts 2 and 3 were never produced). 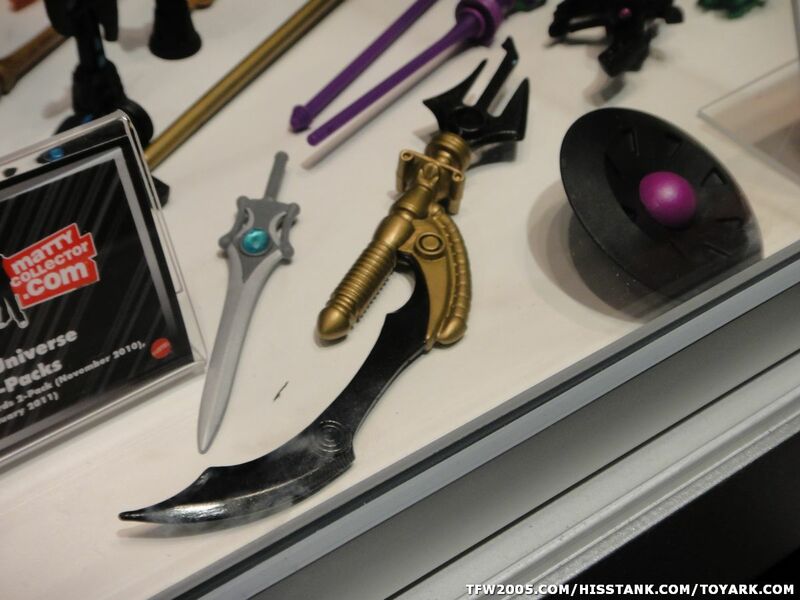 The disguised He-Man comes with Giwildor's Cosmic Key from the 1987 live-action move, as well as Bionatop's gun. Superman and Luthor got their butts kicked and this time, they've called their friends! 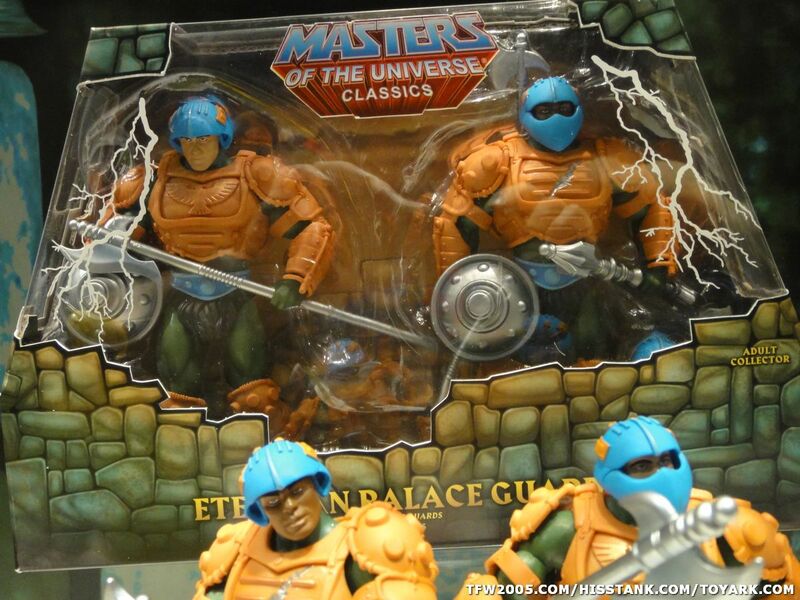 Fortunately, there are plenty of Masters of the Universe to go around! This time, there will be a total of SIX 2 packs in 2011. Apparently, this time the seas and the skies are the backdrop for new battles! The date for this has to be announced. 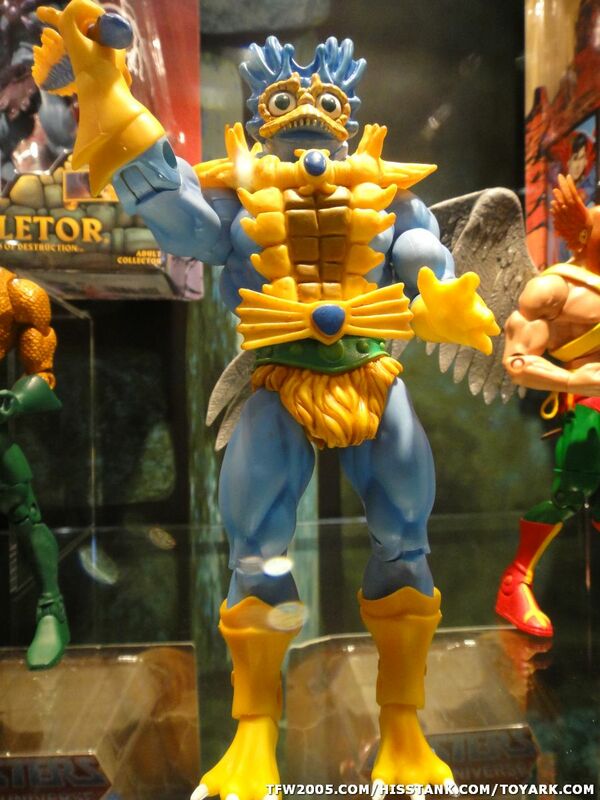 The Mer-Man featured in this two-pack is the blue Mer-Man from the original Alfredo Alcala mini-comics. 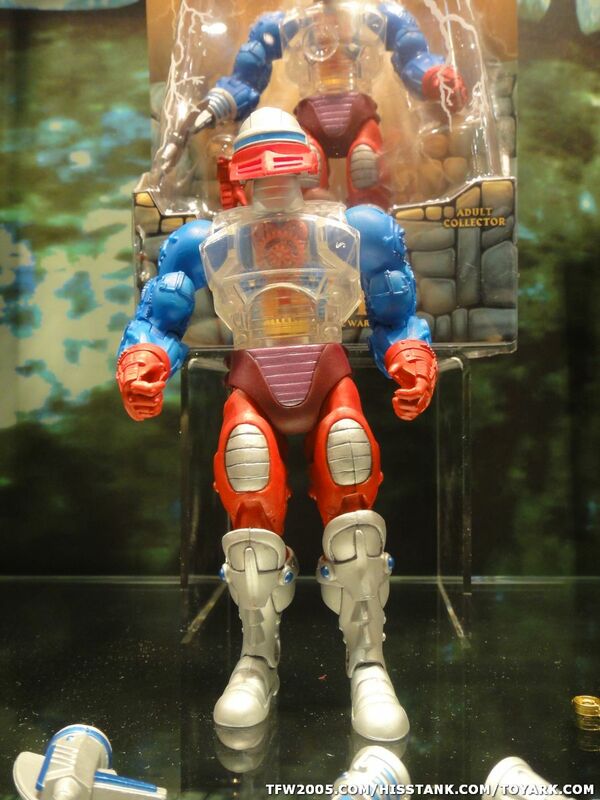 The Stratos figure here is a variant that is a homage to the original Stratos variant which had a RED jetpack and BLUE wings. Unfortunately, the wings aren't in the corrected positions with this variant. Monthly Reissues will be coming out most of next year, but not every month will have them. 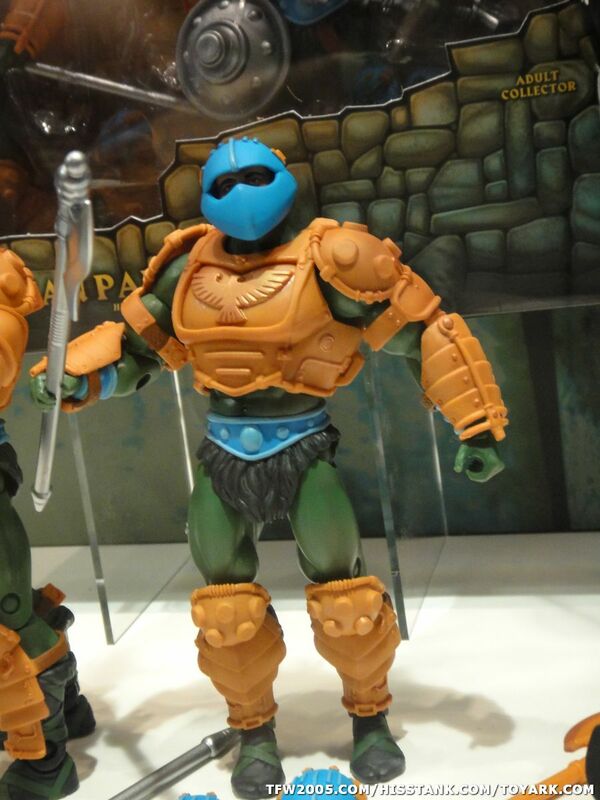 See what the fans have to say about these exciting new additions to the MOTUC line up HERE!